Christians for Biblical Equality has published a groundbreaking study on women’s experiences in the Evangelical Theological Society. On October 19, 2015, Christians for Biblical Equality (CBE) published the results of a first-of-its-kind study of women’s experiences in the Evangelical Theological Society (ETS). 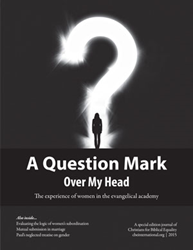 The study, entitled “‘A Question Mark Over My Head’: Experiences of Women ETS Members at the 2014 ETS Annual Meeting”, was written by Princeton Theological Seminary MDiv student and former CBE intern, Emily Zimbrick-Rogers, assisted by Jennifer Aycock. The study was conducted at the 2014 meeting of the ETS in San Diego, CA. CBE’s president, Dr. Mimi Haddad, expressed optimism that this research would generate movement to include women’s voices in an organization whose membership is only 6% female. “Often, leadership is disconnected from the daily realities of being a woman at ETS or in the academy. This research, which includes the voices of egalitarian and complementarian women and men, puts the experiences of women front and center. I am encouraged that ETS members and leaders have taken an interest in the research. Perhaps this will lead to efforts to be more inclusive of women and others who are minorities in ETS,” she said. This year’s ETS convention, to be held November 17-19 at the Atlanta Hilton, will include a woman plenary speaker for the first time since 1986. Additionally, Emily Zimbrick-Rogers will present her research at a special session, hosted by CBE, on Tuesday, November 17 at 7:45 pm at the Atlanta Hilton, room 301. The presentation is open to the public. CBE published the research in a special edition journal, entitled “A Question Mark Over My Head,” distributed to ETS members in the United States and Canada. The journal is available from CBE at no cost.